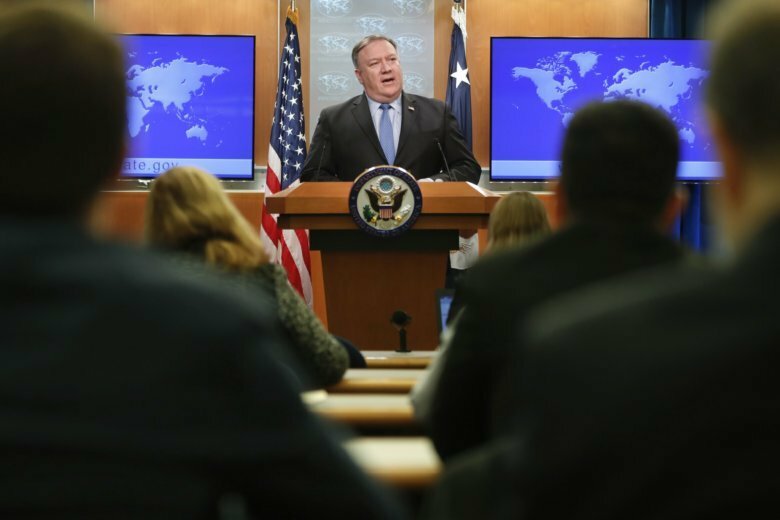 WASHINGTON (AP) — Secretary of State Mike Pompeo said Tuesday the U.S. has “made clear” to South Korea that progress on disarming North Korea should not lag behind the expansion of relations between the two Koreas. Pompeo said there’s “complete agreement” between Washington and Seoul on this, but his comments to reporters underscore U.S. anxiety over a potential disconnect with its close ally. Pompeo said the U.S. and South Korea set up a working group, which is meeting in Washington on Tuesday, to ensure they don’t “talk past each other” on their dealings with North Korea. U.S. Special Representative for North Korea Stephen Biegun was holding the talks with his South Korean counterpart, Lee Do-hoon. Negotiations between the U.S. and North Korea on ending its nuclear program have appeared to stall in the months since President Donald Trump and Kim Jong Un held a historic summit in Singapore, where they made a vague commitment on “denuclearization” of the Korean Peninsula but glossed over how to make it happen. So while North Korea is pressing for sanctions relief now, the U.S. is continuing to intensify economic restrictions and says it won’t relent until Pyongyang denuclearizes. In the meantime, South Korea’s liberal government has pressed forward in cooperation with the North, staging brief reunions of divided families and dialing down military tensions. North Korea on Tuesday blew up some of its front-line guard posts on the heavily fortified border as part of an agreement with the South, Seoul’s Defense Ministry said. That’s not been opposed by the U.S., but last month, South Korea was forced to walk back on a proposal to lift some of its unilateral sanctions against North Korea, which was viewed as premature by Washington. At that time, Trump retorted that Seoul could “do nothing” without Washington’s approval. While fears of armed conflict between the U.S. and North Korea have reduced since their leaders were trading threats and insults last year, doubts linger over the North’s commitment to giving up its nukes. U.S. officials are also wary of any effort by the North to create a rift in the seven-decade U.S.-South Korean alliance.